Why do we travel if not to seek the deeper meaning of life? And yet so often, when we embark on our spiritual journey, we realise that the answers to those big questions lie right here. It’s a paradox isn’t it? Yet travel and the freedom that it offers, the freedom to explore new frontiers without and within is at the heart of it. nagnAta, which means “Naked Wanderer” is an eco-Yoga lifestyle company from Byron Bay, Australia that is inspired by the nomadic muse of travel: its ability to offer inspiration, fuel creativity and embrace the sensuous freedom in life. 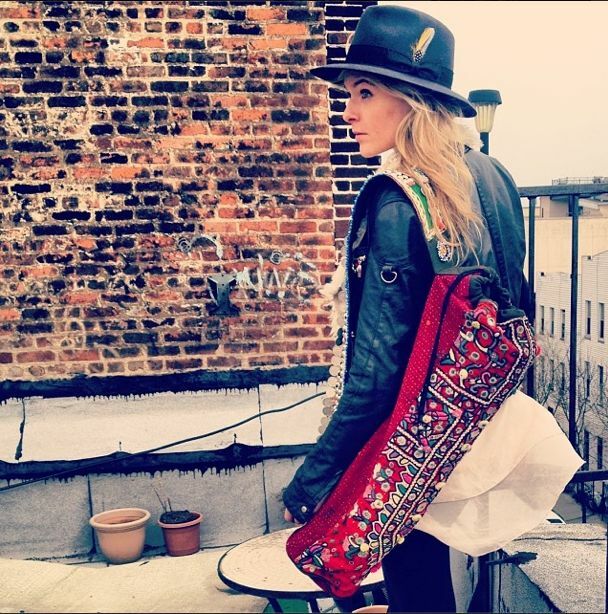 The label’s beautiful, handcrafted designs – currently a collection of yoga mat bags made from vibrant, vintage silk saris and quilts from Rajasthan, India that are rebirthed into modern, bohemian creations, and help to sustain ancient weaving techniques and preserve the culture of indigenous craftsmanship – drew me in. As well I was inspired by the company’s ideals to weave together worlds of creativity, tradition, sustainability and innovation offering a style befitting the modern day yogini. 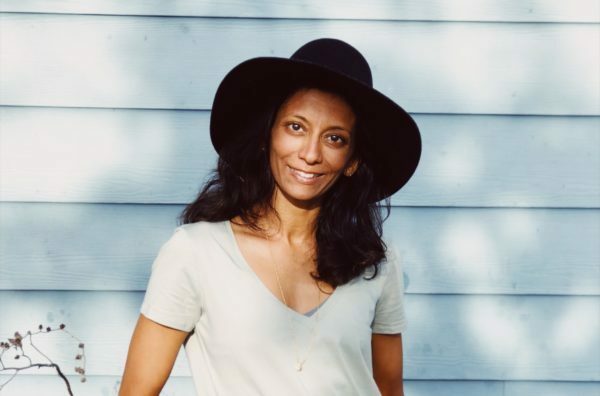 I wanted to kick off the first of the YOGUE Style Files: a series of interviews with independent designers and makers who are inspired by their yoga practice to create. Please read on for a lively conversation about yoga, ethics, creativity and entrepreneurship with the founders of nagnAta: Holly Dixon and and Laura May Gibbs. I know that you will enjoy the interview and the lush images all by nagNata. At the end, you’ll also find a special offer, exclusive to YOGUE readers. Please leave your comments. As always, I love to hear from you. 1. Hello Laura + Holly, please can you tell me a little bit about the creation of nagnata? How did the idea evolve? We are friends from our early days working in fashion. After a few years pursuing our individual paths leading us around the world, we found ourselves reunited in Byron Bay mid 2012. Catching up over raw dessert we discovered we each shared a vision to create a yoga-lifestyle brand. Holly had recently completed her YTT in Bali, while I (Laura May) had been on retreat in Mexico and Guatemala. It was here in Byron the seeds were planted for nagnAta, and where we returned 6 months later to begin the creation of our business. We worked on the concept and business plan of nagnAta for 1 year before officially launching early 2014. A few trips to India and a year of research, discussions, strategic planning, supplier trial and error, product & fabric development, branding, photo shoots, filmmaking, build of our website and on-line store and nagnAta was born. 2. I love that you speak of nagnata as a company founded on yogic principles and sustainable business practices. Can you speak to that and how it translates into the everyday and long-term vision of this brand? The foundations of our nagnAta business model are aligned with our personal and spiritual ideals. We want to create a company we are proud to stand beside, and a platform that enables us to do what we love whilst making a positive contribution to the world. We allude to tantric spirituality in our name and brand philosophy, for the analogy of ‘tantra’ representing the weaving together all threads of our being into one harmonious whole. This is reflected in our business by weaving together worlds of creativity & spirituality, tradition and innovation, and mindfully integrating practices both new world & old. It’s our long-term vision to develop fair-trade projects around the world supporting communities in need and celebrating the traditional handcraft of the regions. For our products that require us to work with modern technology and manufacturers, we aim to be transparent with our supply chain, work with trustworthy teams of people and use sustainable fibres and production methods. And while this presents constant challenges, we are committed to making the most sustainable choices we can and will always look for opportunities to better ourselves. In our every-day actions we make eco-friendly efforts in the small details like printing locally on recycled paper, reducing packaging waste by making re-usable organic cotton naturally dyed tote bags in India and using hemp string to wrap our products in. Do you practice yoga and or other spiritual practices? How do they impact you in your life and work? Holly; Yoga has been in my life for many years now. Although I find my asana practice is not always as consistent as it could be I consider myself a very spiritual person and connected in my day to day living. I love to spend time on my own, tapping into my surrounding and taking that time to feel gratitude and contentment. I love the clarity of mind I experience through connecting to my environment or to my body. It keeps me calm and rational and makes me a happier Holly! Laura May; I’ve been practicing yoga for around 8 years, and now have dedicated practice that integrates hatha yoga and kundalini yoga. My experience particularly through my practice of Kundalini yoga is the ability for powerful energetic shifts within my body and mind, one benefit being to channel this newly flowing energy into creative outlets. Yoga is the foundation of my life and spiritual path, and makes me a much more peaceful person. 4. What is a typical day in your life? Do you have any daily rituals? Describe. Holly; I wake up, do something physical movement whether it be yoga, a swim in the ocean or a walk along the beach and then I come home for a fresh juice – always my daily ritual. It gets me focused for the day. Once I’m at the computer it doesn’t take long for the time to disappear and the day to slip by. In the evenings I water my garden and then I love to cook dinner for my partner and/or friends and family and spend valuable time with them catching up. Or I may get to a yoga class if I have not been in the morning. Laura May; My daily rituals revolve around my yoga practice. Since deepening my kundalini practice I now do Bound Lotus for 31 minutes (11 if I’m time poor or being a lazy yogi!) to the Ray Man Shabad then relaxing to Ra Ma Da Sa mantra. If I miss this as an early morning sadhana (still a challenge rising before the sun) then I’ll practice late at night. If I ever skip my Bound Lotus I notice a difference in my energy, mind and the flow of my day ~ everything feels more erratic. This is my meditation and time to connect in. The rest of my day would involve a yoga practice, often breakfast in town after class then head to the studio to work with Holly. After work I love an ocean swim as the sun sets, then either hang with friends or some personal chill time which usually involves books and incense. 5. What inspires you? How do you sustain creativity in your life? Can you describe the creative process for you? Travel provides an immense source of inspiration and way of life for us, hence our name nagnAta translating to ‘naked wanderer’ in Sanskrit. We sustain our creativity by allowing space for it. Time dedicated purely for creative concept, within our business timelines. Also collaboration is a beautiful way to let creativity flourish as it often runs down a path you wouldn’t have reached alone. Our creative process varies depending on the project. The original concept for our yoga mat bags formed while sourcing textiles for other fabric development in India. The first proto was developed in a very instinctive moment of expression and excitement for the textiles surrounding us to create from. That’s the beauty of travel you never know what inspiration you’ll discover and the ideas that will form. 6. What is “luxury”? Our emphasis is on creating high-quality, directional product from the finest materials and production methods. We aim to bridge a gap between aspirational product, and product rooted in sustainable practices. We reference the term ‘luxury’ when placing our brand within the market as our quality and naturally our price-points, are reflective of this level of workmanship we choose to align with. nagnAta is a synthesis of yoga lifestyle and designer fashion, though by no means do we want to be inaccessible to the everyday yogi. We have a variety of products in development, which will offer a wide range of pricing, whilst maintaining the timelessness and specialty of our designs. We are dedicated to educating our customers on our product so they can feel genuinely good about investing in a nagnAta piece. We find people who connect and support the brand are those who appreciate quality and seek product with soul. 7. I love the lyrical, lush quality of your images. Who is the “nagnata” muse? What does she represent? Thank you Insiya. We hope to engage people through beautiful visuals with the soulful message of the brand behind it. Those we’ve created with so far are close friends, so they’ve been close collaborations and we feel there’s an intimacy that comes through our shared work. Our muse is spirited, soulful and nomadic at heart. There’s not one particular person in mind just the embodiment of these qualities. 8. How long does it take for a Nagnata yoga mat bag to be created? One artisan can make between 1-2 bags per day depending on the raw materials we provide them (some fabrics and trims take more work than others to restore and re-construct into the bags). Prior to this we spend time sourcing and selecting fabric combinations and trims, and are also there at the final stage for quality control of each piece. We are usually in India a few weeks working on one yoga bag collection. Though we have also learnt that strict timelines don’t adhere in India so we always allow for extra time. 9. What are some of the most important lessons you’ve learned from all your travels? I’d love to hear about your encounters with local people. Lesson 1: Deeper Appreciation & Gratitude Travelling to developing countries such as India is a humbling and mind opening experience. Lessons are learnt moment to moment every day as you are continually challenged by the vast cultural differences from our western upbringing. You see people living simply, but they are happy. You experience great kindness and warmth from locals, strangers who smile at you (often after long lengths of staring!) or go out of their way to help you when you’re lost. You wonder, or rather you see, what’s wrong with our culture of wanting way beyond our needs. It was interesting on our first trip to India when we noticed some days there were many artisans working on our yoga bags and other days not many at all. We discovered the people only worked on a ‘need’ basis, and the bosses were accepting of this. If the workers had earned enough money to cover the family’s expenses for the week they would not show up for work, preferring to spend the day with their families. Frustrating to maintain timelines though a good attitude to life! Working to live not live to work. On another trip to India we arranged to visit a special charitable trust in Central India, supporting the role of women in handloom weaving. This trust is working toward making handloom a profitable, fulfilling, sustainable and dignified income-earning activity particularly for women in rural areas of India. The experience of visiting this weaving village was nothing short of inspiring. We worked in the classroom with young aspiring Indian designers and weavers to encourage them the craft of their communities is valued. It filled our hearts with pure joy and cemented our ideas on working towards this fair trade, ethical business model we have envisioned for nagnAta. Lesson 2: Delving into Patience Practicing patience when trains are late or never come or when they do you’re squashed body to body on long journeys, or you’re taken round in circles by lost tuk-tuk drivers with whom who you can’t speak their language. Or being continually ripped off and scammed, or ill for weeks and finding yourself in awkward and uncomfortable situations mid journey where you just can’t hold it in! These experiences always make for a great story afterwards, it’s finding the humour in that moment that is sometimes challenging. The motherland, she tests you continually. How you react within yourself and more importantly towards others is what builds character and offers up such lessons and growth from travel. We apply ‘consciousness’ in our ‘creative’ process, making our best efforts sustainably in each step from concept to creation. We are ‘conscious’ of what we ‘consume’ with our choice of supplies and raw materials. As consumers of other brands products in our daily lives, we support labels with a good ethos behind them, and in return want to create a brand people feel good supporting. 11. One of the things I struggle with is how to balance my desire for beautiful things that express who I am, while keeping in mind sustainability in the entire production chain from the inception to the end product in my hand as a consumer; and the idea of not consuming “too much” especially in yoga sphere because I feel that as yogis we are looking at things beyond the surface – or at least i hope that we are!!! Could you speak to that, in the context of Nagnata? An important consideration and inner battle we can relate to. We have spent many hours in contemplation and continual discussion surrounding ethics and sustainability and our responsibility as a brand. Especially given our products are considered rather desirable pieces and you could live without them – however practical they may be for a yogi! We want people to feel genuinely good about investing in a nagnAta piece. We are as open as we can be with our development and stories behind the pieces so people can connect and engage with us and those that helped create them. As a brand it’s our responsibility to ensure we do everything within our power to create product that can add positively in some way to everyone’s life who’s involved – whether it’s helping support the makers, business or family, or create something beautiful for a woman/man to take with them to yoga everyday to encourage and inspire their practice. We are also believers that beauty, creation and self-expression should be celebrated and shared. We just need to create and consume in balance and harmony with this earth. Holly: Everyday relaxation for me involves connecting with nature in some way. Taking a walk, appreciating the sights and sounds and finding that space to focus on deeply and consciously my breath – breathing it all in and letting it out. I also love to relax in the bath! I listen to music (often Kristina Das) as I soak and burn scented soy candles. I also love to indulge in a good glass of red over a long chat with loved ones…! Laura May: I love reading books, that’s my time to unwind while still nourishing my mind. Burning incense, listening to music and writing. Cooking to mantra, spending time in nature, watching the sun set, swimming in the ocean, meditation – or if all of that’s too mellow for my mood I’ll go out dancing! 13. If you had one wish for the world, what would it be? Our wish would be that all people in this world could co-exist in harmony with each other and Mother Nature. That we could use all the incredible scientific advancement and knowledge gained up until this point, towards the preservation and repair of the damage we’ve done to this earth – instead of continuing down paths of destruction for the sake of financial gain for greedy individuals. So we still have an earth for future generations to enjoy. 14. Art or fashion? There’s no separation in our eyes. As designers we perceive fashion as a wearable form of art. Though I suppose taking this analogy, the disposable fast fashion of today is like bad art! Thanks Holly and Laura. 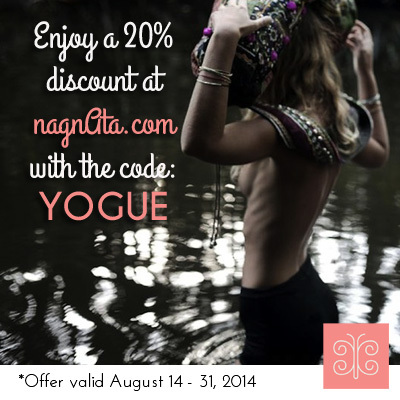 And YOGUE readers, as promised, here is your special offer on nagnAta’s beautiful eco-luxe yoga mat bags. *Lastly, all photos in this post are courtesy nagnAta, please do not use them without permission. Thank you. Il permet de centrer son énergie avant de progresser pour l’élever.